Scrambled Eggs are one of those recipes that seem relatively easy to prepare, but, for some reason, perfect scrambled eggs are hard to master. I’m giving full credit to the new 10-inch ceramic-coated Induction 21 Steel fry pan my friends at Chantal asked me to try out. 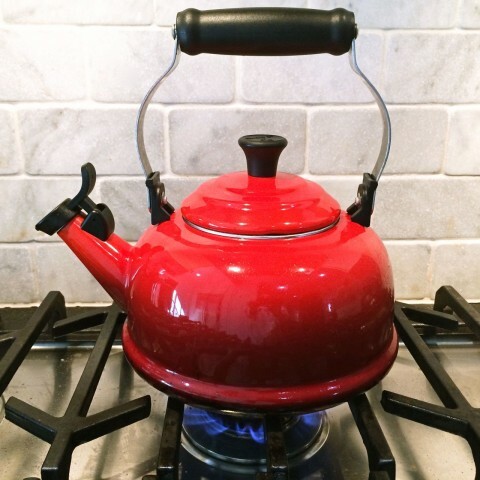 The pan has copper melted into the steel, which conducts heat quickly and evenly. Even cooking temps are important so your scrambled eggs will have those light fluffy curds (not grainy dry ugliness). 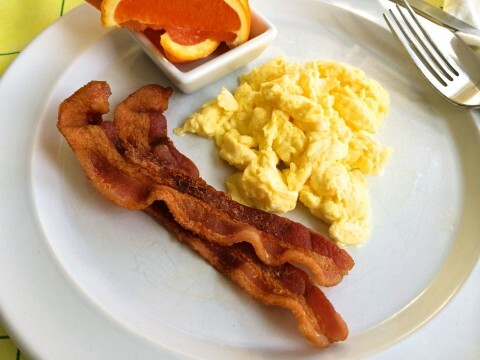 The pan is also ceramic coated, which means it’s a non-stick pan… but doesn’t emit toxic fumes when it’s overheated. It is PFOA and PTFE free (click here for more info on what that means and why that’s a good thing). Chantal doesn’t recommend using non-stick sprays… butter and oil are best. It’s nickel-free… which is a plus, because I’m allergic to nickel! 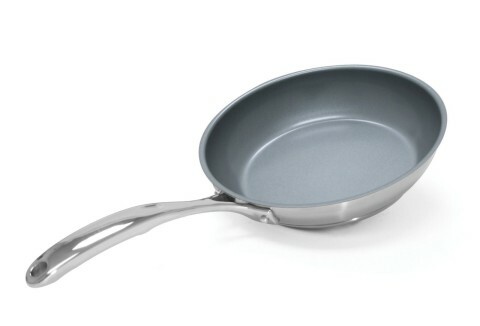 The pan is made with titanium for added strength and durability… super important if you cook a lot. I really like that the long ergonomic handle stays cool to the touch while cooking. It features a wide flat bottom, sloped sides and has a dripless pouring rim to reduce spillage. 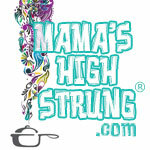 I used it on my gas cooktop, but it’s perfect for induction or other cooktops. 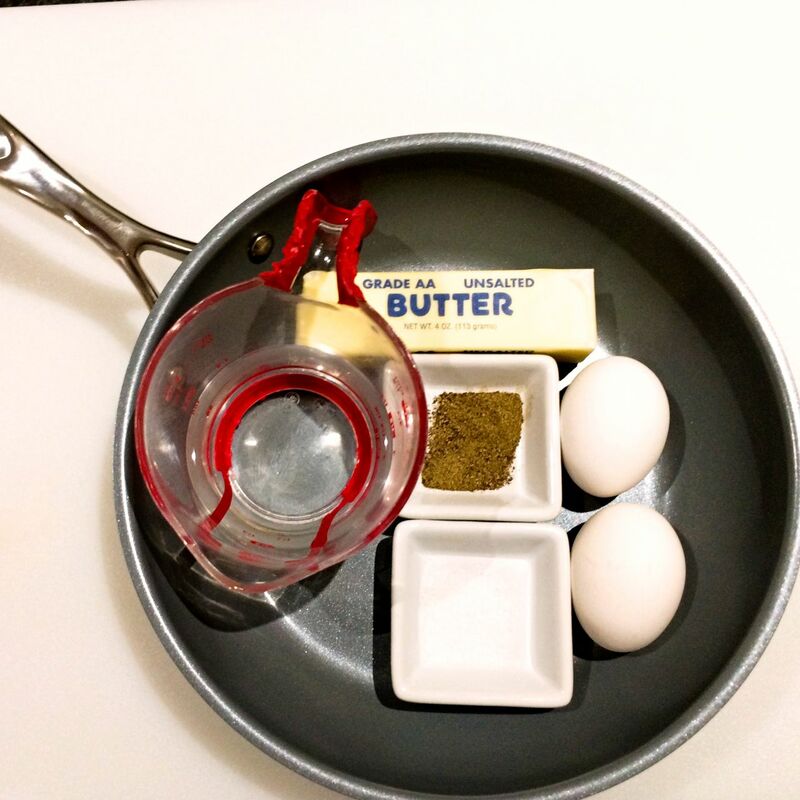 This pan does not need to be preheated and a low to medium setting is all you need for most things you’ll prepare. It is not dishwasher safe, but I don’t put my pots and pans in the dishwasher anyway. 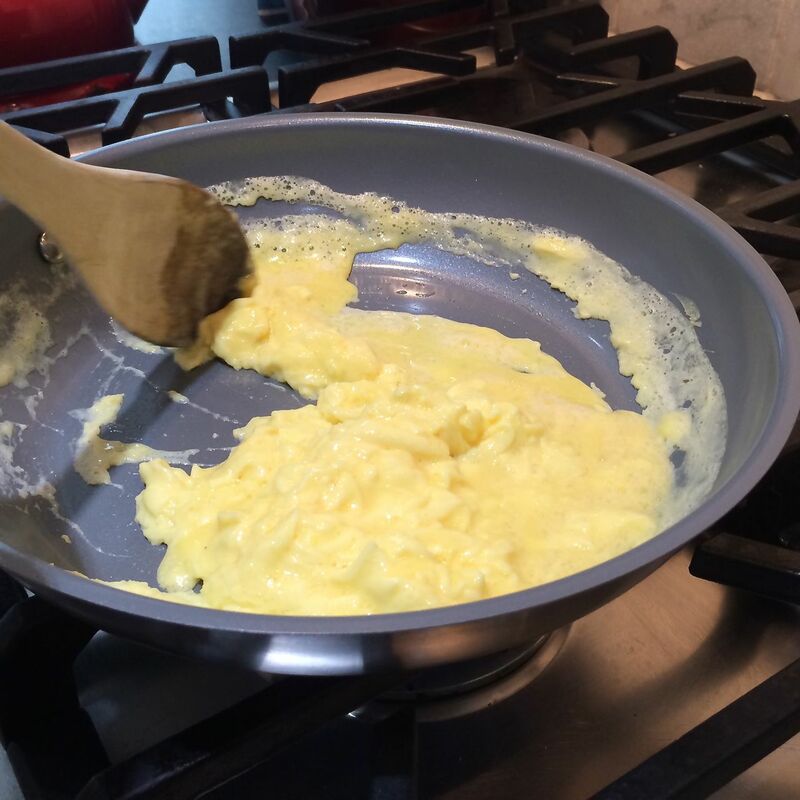 This pan is great for searing fish fillets, browning chicken breasts, sautéing vegetables… or making the Perfect Scrambled Eggs! There’s a step-by-step tutorial after the recipe! 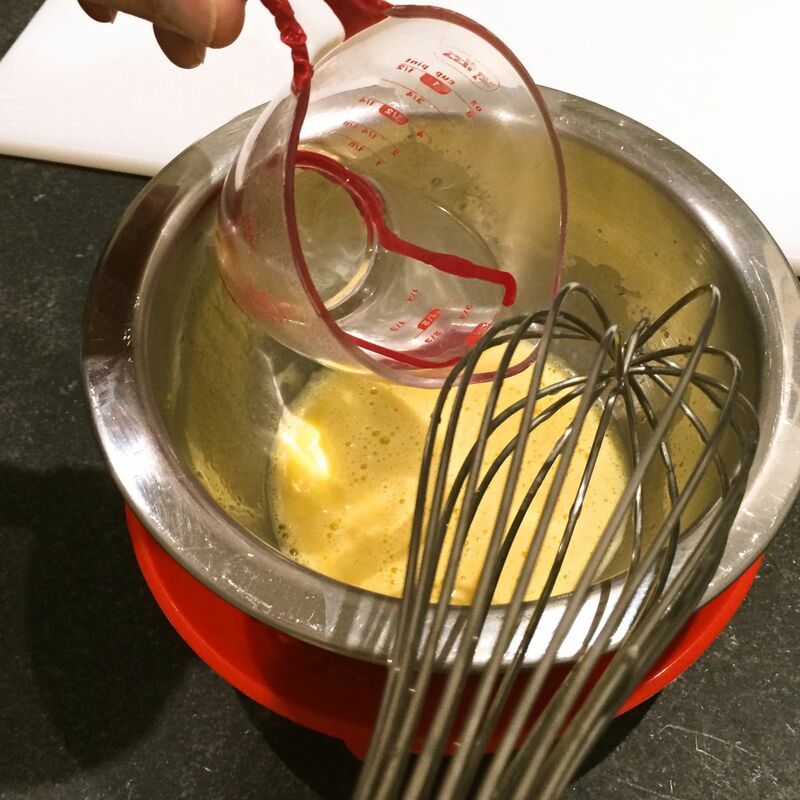 Beat the eggs vigorously until completely blended (you want as much air in them as possible so that they’ll be fluffy); set aside. 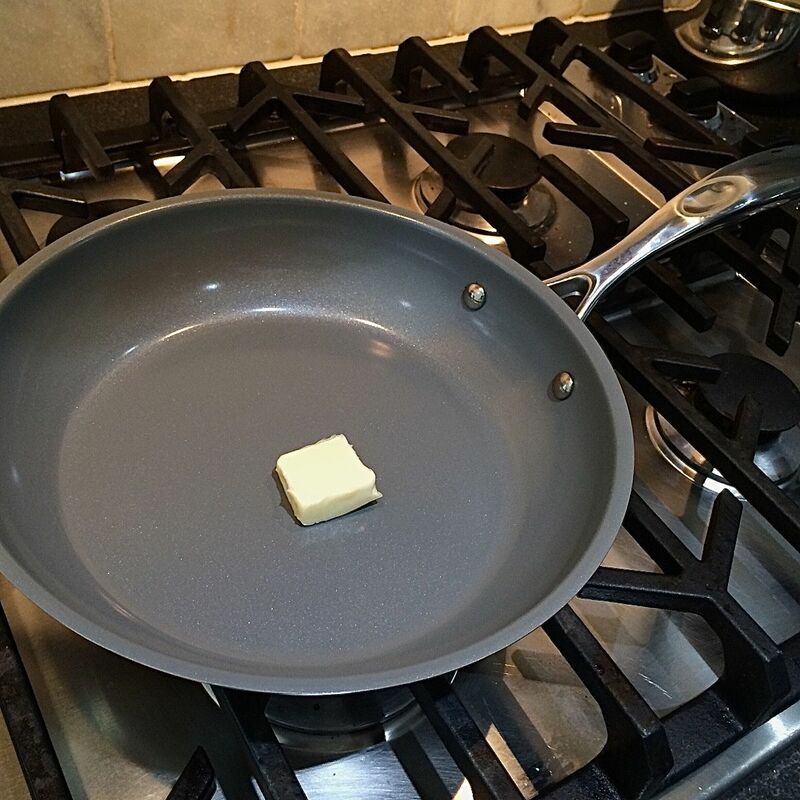 Heat butter in the Chantal Induction 21 Steel™ Fry Pan on medium low heat until melted. 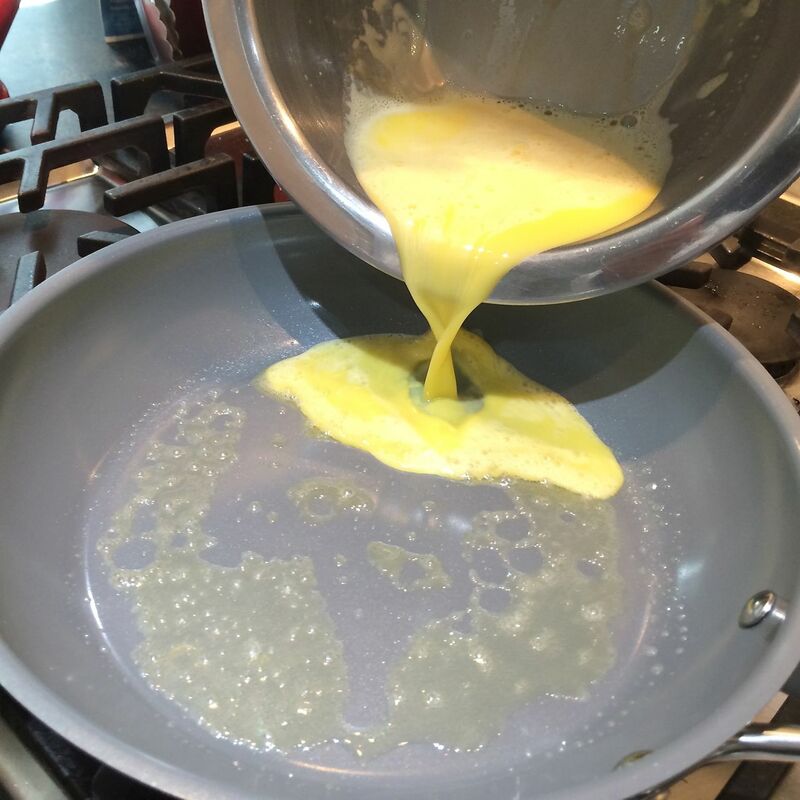 Beat boiling hot water into the eggs and pour immediately into the fry pan; reduce heat to medium low. Push eggs gently across the pan with a wooden or silicone spatula, forming large, soft curds. 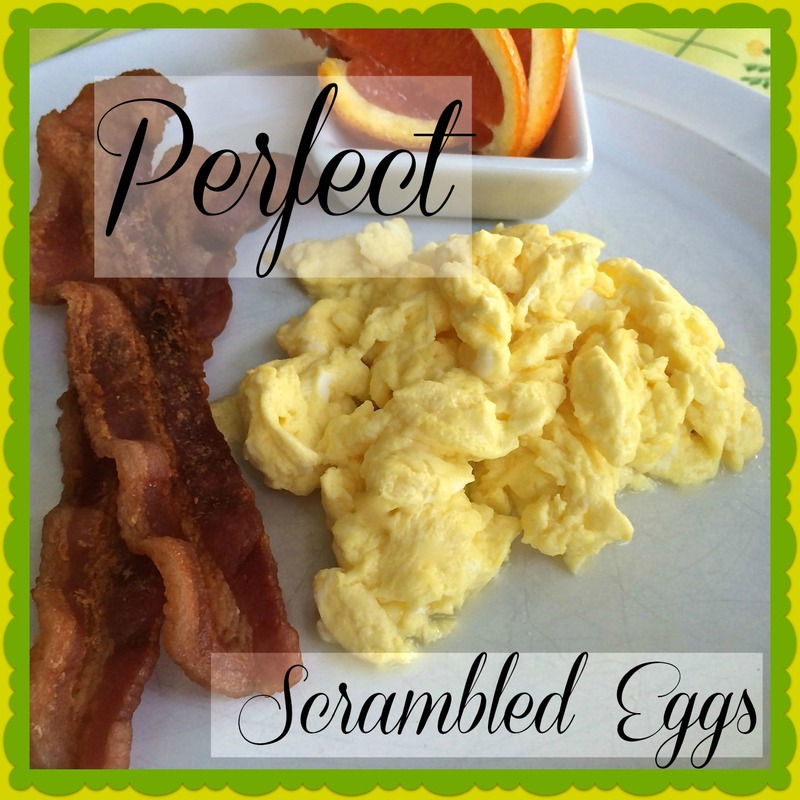 Cook for 1 to 2 minutes until thickened and no visible liquid egg remains. Remove from heat and serve immediately. 1. Gather your ingredients: 2 eggs, ¼ cup boiling hot water, 1 tablespoon butter, salt and pepper to taste. 3. 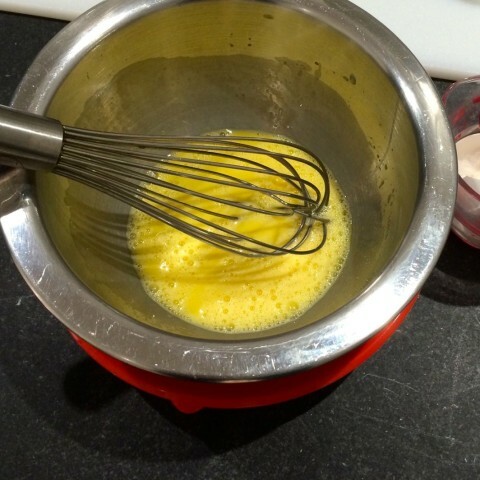 Beat the eggs vigorously until completely blended (you want as much air in them as possible so that they’ll be fluffy); set aside. 4. Heat butter in the Chantal Induction 21 Steel™ Fry Pan on medium low heat until melted. 5. 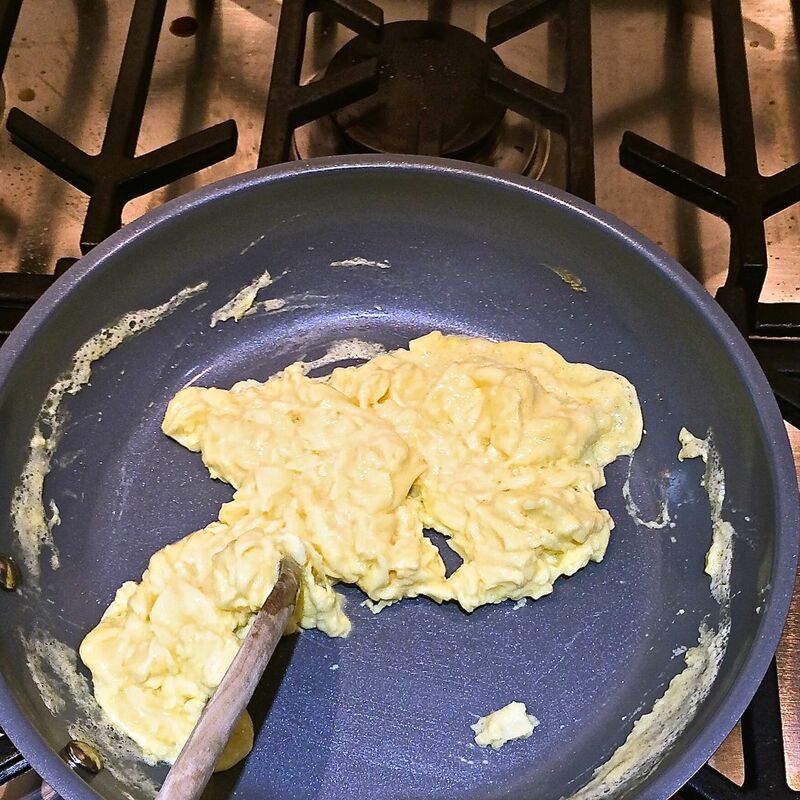 Beat boiling hot water into the eggs. 6. Pour immediately into the fry pan; reduce heat to medium low. 7. 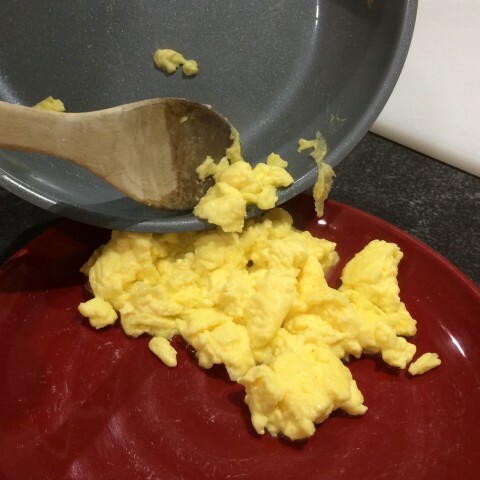 Push eggs gently across the pan with a wooden or silicone spatula, forming large, soft curds. 8. Cook for 1 to 2 minutes until thickened and no visible liquid egg remains.